When you absolutley need your cigars to get there in one piece, no matter what. The X-treme series of cases are the toughest and roughest cases out there and are up to any challenge. 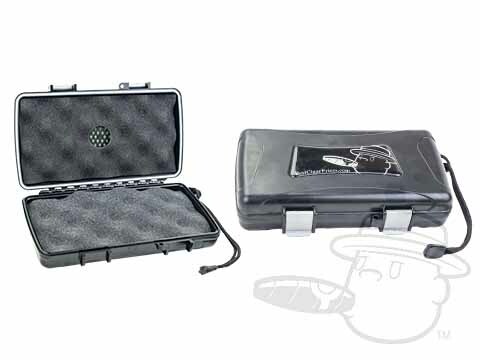 Made from high impact plastic with an absolutely air and watertight seal, humidifier, foam cigar-shaped inserts and lock loop, its hard to imagine any situation where these cases would not fit the bill. A favorite of our military customers! Great for traveling I can check the case with my bags and know they’re protected. I purchased this based on the recommendation of Charlie at BCP, and I am glad I got it! It is rock solid and seems to work. I've used it on a few trips and all my cigars seemed to be just fine. The construction should be 6 stars, I'm not sure it is possible to break this thing. It's also interesting to note that there's an air-tight seal around the end, so this thing would probably keep water out if you dropped it in the lake or something. Anyways, rock solid, especially for trips away from home for camping or any other small trip where you just want a few cigars to stay humidified and not get physically damaged. Oh! A special note I found out, if you smoke fat cigars, only like 4 will fit in it. It's made to fit 5 normal sized cigars. Bestcigarprices Travel Cigar Protection Case #5 is rated 4 out of 5 based on 8 customer ratings.